I am having so much fun with the Our Daily Bread Designs October 2016 Release and wanted to share another a few cards that I designed using only the new ODBD Christmas Card Collection 2016 Paper Pad along with the new Peace Border Die, previously released ODBD Dies and ODBD Fun & Fancy Folds. I have incorporated the Splitcoaststampers’ Ways To Use It WT604 “Fancy Folds” Challenge, the CCC16 Christmas Card Challenge and the Stampin’ Royalty SR348 “Anything Goes”Challenge. 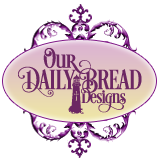 If you have not already had a chance to visit the above galleries yet, I hope you will do so as well as stop by the Our Daily Bread Designs Blog- fabulous inspiration from all! 1). A piece of white cardstock with the ODBD Beautiful Borders Dies. 2). A piece of white cardstock with the ODBD Lavish Layers Dies (largest frame). 3). 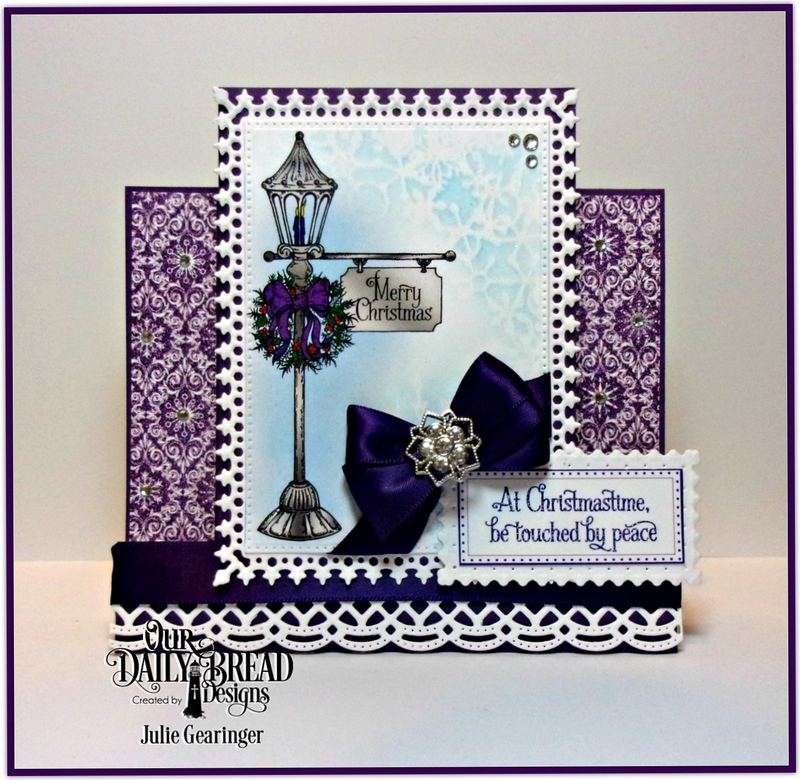 The lamppost patterned paper from the ODBD Christmas Card Collection 2016 Paper Pad with the ODBD Pierced Rectangle Dies (use the die that fits within the frame in the step 2). 4). A piece of white cardstock with the ODBD Lavish Layers Dies (second smallest frame). 1). Two pieces for the side step panels. 1). Cut two narrow strips from the ODBD Christmas Card 2016 Collection 6x6 Paper Pad and adhere to the side panels. 2). Add the ODBD Beautiful Borders Die cut along with the dark purple satin ribbon to the front dark purple cardstock panel and mount onto the card base. 3). Use a stencil brush with light blue distress ink and a snowflake stencil to add a bit of background on the die cut lamppost panel, add the triple dark purple ribbon bow to the corner and wrap the ribbon ends behind the panel. 4). Mount the lamppost panel to the die cut ODBD Lavish Layers frame and mount onto the center part of the step card. 5). Trim the sentiment from the ODBD Christmas Card Collection 2016 Paper Pad and adhere to the die cut ODBD Lavish Layers frame (in step #4 above). 6). Add the sentiment panel to the card front. 7). Add the rhinestones to the corner and the embellishment to the center of the bow. 8). Use a clear glitter pen to apply shimmer to the lamppost. 1). Two pieces of white cardstock with the ODBD Filigree Frames Dies- one with the largest die and the other with the second to the smallest frame. 2). A rectangle from the dark blue snowflake patterned paper in the ODBD Christmas Collection 2016 Paper Pad (to fit the center of the large ODBD Filigree Frames Die cut in the above step) with the ODBD Rectangles Dies. 3). A piece of white cardstock with the ODBD Layered Lacey Ovals Dies (the second to the largest die in this set). 4). A piece of dark purple cardstock with the ODBD Ovals Dies (to fit the center of the oval in step #3). 5). The Nativity Family image from the ODBD Christmas Card Collection 2016 6x6 Paper Pad with the ODBD Stitched Oval Dies. 6). A piece of white cardstock with the ODBD Beautiful Borders Die. 7). Two pieces of dark purple cardstock with the ODBD Bitty Banners Dies. 8). One border from dark navy cardstock with the new ODBD Peace Border Die. 9). The sentiment from the ODBD Christmas Card Collection 2016 6x6 Paper Pad with the ODBD Pierced Rectangles Dies. 1). Two strips of the dark blue snowflake patterned paper. 1). Two pieces for the side steps. 2). A longer piece for the center front “step”. 1). Adhere the Beautiful Borders Die cut to the front step and adhere the Bitty Borders Die cuts at the top. 2). 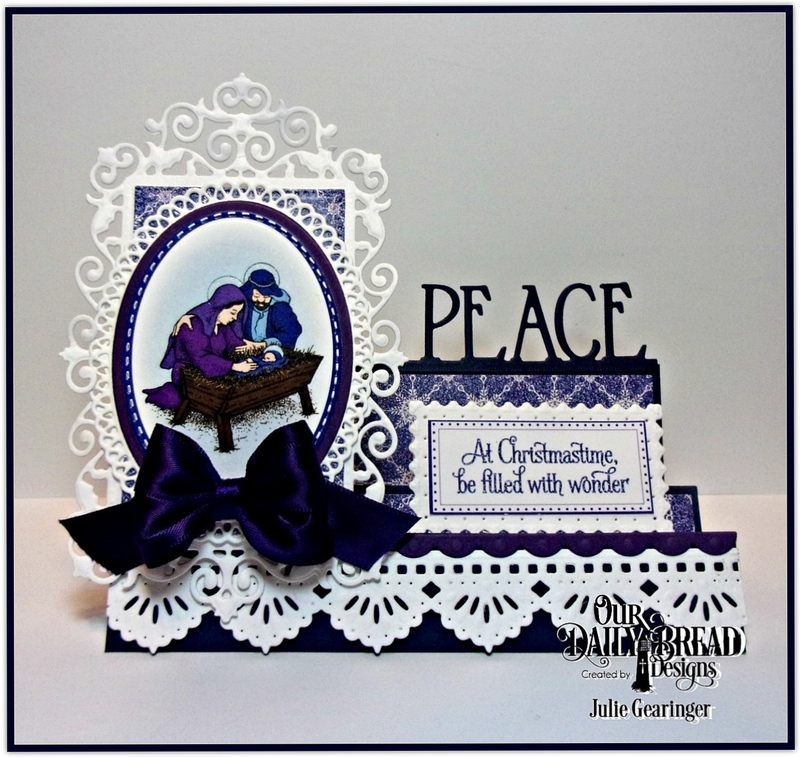 Mount the Peace Border Die cut to the top side step and adhere the dark navy layers followed by the ODBD Christmas Card Collection 2016 6x6 Paper Pad layers. 3). Mount the large Filigree Frames die cut to the center panel, add the die cut ODBD Christmas Card Collection 2016 rectangle and mount onto the left hand side step panel (this will overlap the front step layer). 4). Adhere the Nativity Family oval die cut to the dark purple oval die cut, mount onto the white ODBD Layered Lacey Ovals die cut and mount onto the card base. 5). Mount the die cut sentiment onto the smaller ODBD Lavish Layers die cut frame and adhere to the first side step. 6). Add the dark navy triple ribbon bow to the bottom of the focal image oval. 7). Use a clear glitter pen to add highlights to the Nativity Family image. I loved designing with the new ODBD Christmas Card Collection 2016 6x6 Paper Pad along with the Fun & Fancy Folds collections and hope I have inspired you- there are so many options that you can create from one paper pad! Wow, Julie, they all are gorgeous fancy fold cards! Love the new release stamps and dies, this month.